Across these past six years, spanning from when Obamacare was first taking shape to today, many conservatives have kept their eye on the prize, while many center-right pundits and office-holders have grown impatient and lost interest in the fight. While almost all Republican voters remain steadfastly committed to repeal, it has become increasingly apparent that congressional Republican leaders, and their corporate backers, do not fully share that commitment. The same can be said of some in the presidential field. At the same time, it has long been clear that the key missing ingredient in defeating Obamacare — in stopping this effort on the part of the Left to trample on the ideals of the American Founding — has been to have a winning conservative alternative that a prominent leader of the conservative movement is willing to step up and champion. Scott Walker has now done so. This morning, he became the first top-tier Republican presidential candidate to propose a concrete, viable alternative to Obamacare’s 2,400 pages of federal largess. No one did so in 2011 or 2012, and no one had yet done so in 2015. Now that has changed. Walker’s alternative to Obamacare is well-conceived across the board. It would lower costs, secure liberty, and make it possible for anyone who wants health insurance to be able to get it. It would repeal Obamacare’s unprecedented individual mandate, its employer mandate, its coverage requirements, its abortion funding, its centralization and consolidation of power and money in Washington. In fact, it would repeal every last word of President Obama’s signature legislation. In its place, it would offer real reform. It would encourage people to shop for value and ask to see prices. It would promote the use of Health Savings Accounts and reduce the role of the insurer or government as middleman. It would preserve the employer-based market and revitalize an individual market that the federal government had broken even before the Democrats passed Obamacare and made everything so much worse. In so doing, it will help pave the way to full repeal. Seventy years ago, the federal government began to undermine our health-care system — through the tax code — by favoring employer-based insurance over individually purchased insurance. If you make $35,000 and get insurance through your employer, you get a nice tax break (in that the value of your insurance isn’t taxed as income). If you make $35,000 and your employer doesn’t offer insurance, you get taxed on your income and then have to buy insurance with what’s left, with no tax break whatsoever. Obamacare didn’t fix this longstanding inequality in the tax code. Take the typical single woman in her late-30s who makes $35,000. Under Obamacare, she gets no subsidy — she’s too middle class and too young. (Obamacare is for the near-poor and near-elderly.) Under Gov. Walker’s alternative, she’d get a $2,100 tax credit to help her buy the health insurance of her choice. That tax credit would go directly to her, whereas if she’d been eligible for an Obamacare subsidy, it would have gone directly to an insurance company. If she doesn’t itemize her taxes (and likely even if she does), her tax credit would come entirely in the form of a tax cut. If she didn’t use the whole $2,100 for insurance — say, if she shopped for value and found catastrophic insurance for $1,500 — she could put the her ($600) savings into an HSA that she would control. Walker’s tax credits would be simple, refundable, and — aside from three simple age-bands — flat. Thus, the IRS wouldn’t have to verify anyone’s income, there would be no work-disincentives, no marriage penalty, and everyone could quickly compute what they or their family would be getting. Those under the age of 35 would get a $1,200 tax credit; those between 35 and 50 would get $2,100; those 50 and over would get $3,000; and parents would get $900 per child. So a typical family of four would get $6,000 ($2,100 per adult, $900 per child) to use to help buy health insurance of their choice, rather than being forced to buy government-approved insurance through a government-run exchange. In addition, Walker’s alternative would offer a one-time, $1,000-per-person tax credit to anyone who opens, or already has, an HSA. (A family of four with an HSA would get $4,000.) This HSA tax credit would be available both to those who get insurance through their employer and to those who buy insurance on their own. The amazing thing is that such an alternative, which would finally address a longstanding inequity in the tax code in a way that doesn’t neglect the middle class, would save a fortune versus Obamacare. Moreover, it would provide a tax cut even versus the pre-Obamacare status quo. The nonpartisan Center for Health and Economy, co-chaired by liberal Princeton health economist Uwe Reinhardt and center-right former CBO director Douglas Holtz-Eakin, scored a very similar proposal‎ (put out by the 2017 Project, which I run) and found it would save more than $1 trillion in federal spending over a decade versus Obamacare, while increasing access to doctors, lowering insurance premiums, and resulting in 6 million more people having private health insurance than under Obamacare. 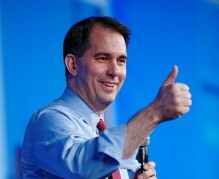 At the same time, Walker’s alternative wouldn’t change the tax break for the typical person’s employer-based insurance. It would merely close a tax loophole — by capping the tax break on high-end plans — that currently incentivizes people to get more and more employer-based insurance (because the more expensive their insurance, the greater their tax break, without limit). By closing this loophole while offering a long-overdue tax break in the individual market, Walker would more or less equalize the tax treatment of employer-based and individually purchased insurance without affecting the typical person’s employer-based insurance — except that those with employer-based insurance would subsequently have access to a new HSA tax credit and would be freed from Obamacare. The Wisconsin governor’s alternative would also provide a few commonsense protections that would enable people with preexisting conditions to get insurance without undermining the very notion of insurance itself (which dates back to the Renaissance or beyond). Obamacare says you can wait until you’re sick or injured to buy “insurance” at the same price as if you’d been buying it all along, thereby driving up everyone else’s costs. Walker’s alternative would simply make it so that, if you already have employer-based insurance, you could move to the individual market without being charged more for a “preexisting condition” that was already covered. If you come of age and are buying insurance on your own for the first time, you couldn’t be charged more because of a childhood condition that your parents’ insurance (or lack thereof) may or may not have covered. If you are having a baby, you wouldn’t need to buy insurance before the baby is born but could buy it shortly after the birth without being charged more if he or she has a preexisting condition. But aside from these policy details, the key thing is this: Americans have been thirsting for a well-conceived conservative alternative to Obamacare for six years. Finally a leading Republican has offered one. Obama’s centerpiece legislation is now on a course toward repeal — which would probably be the biggest loss ever for progressives and the biggest domestic-policy win in the history of the conservative movement. There is no dispute that immigration increases the size of the economy; the question is whether it increases the economic well-being of the typical American.